I’m so excited for today’s online class. 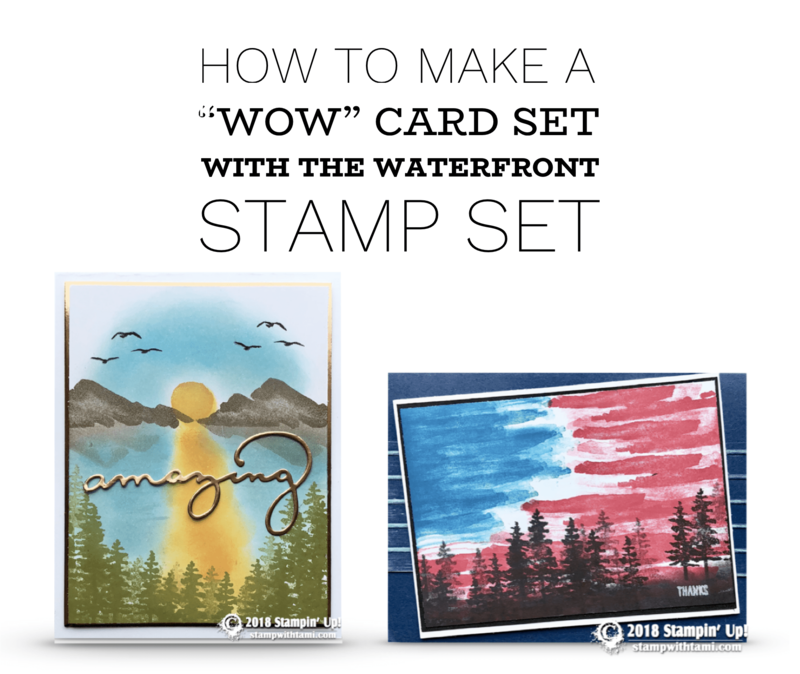 I’ll be creating these 2 gorgeous “wow” cards from the Stampin’ Up! 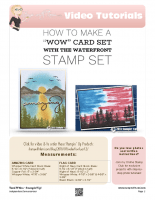 Waterfont Stamp Set. I have become slightly addicted to this set and it’s versatility. Today’s card set will feature some fun techniques including sponging with sponge daubers, stamping off to create depth and more. I gave a sneak peek preview of these cards on the Stampin Scoop Show Wednesday. 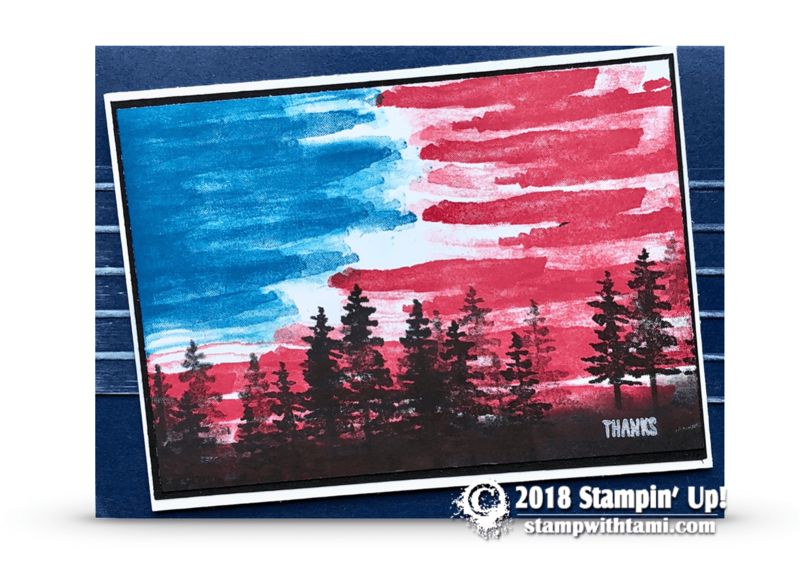 Check out episode 49 for more card ideas featuring the Waterfront stamp set. And my Waterfront Blog Series for instructions, measurements and more fun cards from this set. The Waterfront Stamp Set was designed by my friend Connie Heisey for her Million dollar set. Connie was the 5th demonstrator to have ever hit $1Million in personal career sales. Here’s a picture we took after she hit in 2014 of the first 5 Million Dollar sellers (at the time there were only 5). 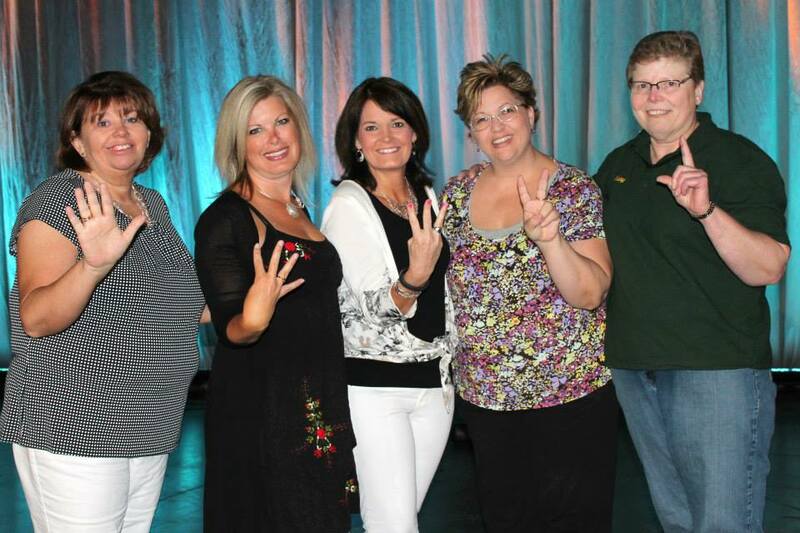 In order (right to left): Mary Polcin, Lisa Fast, Joyce Feraco, Tami White and Connie Heisey. If you’re wondering what stamp set was my Million dollar set, it hasn’t been released yet. But I did get to name the stamp set White Christmas. I’m creating these cards live on Facebook and giving away some bonus prize patrol for viewers. If you can’t make it live, this video replay will be on here on my blog, Facebook , Youtube and Vimeo, along with an “after live” drawing (below). Entry to this “after live” prize patrol giveaway is free and requires a video comment entry. To enter the drawing, simply click and watch the video on Facebook or YouTube and leave a comment in the video comments section. No purchase necessary. Absolutely loving this ! I own it and have not even used it yet ! I think you are going to addict me too !!! Such a good feeling ! Thank ou, love you 😍 Tami !! Awesome cards. Looking forward to seeing the stamp set you designed. Any idea when it’ll be released?? The FB Live today demonstrating these cards was great. Thanks for the inspiration, class guides and SO MUCH MORE! Loved your live video today on Facebook,Tami!! I have this set and can’t wait to make these two cards! Thanks so much for inspiring me! !